I’ve been working with a team of people for the last 6 months who have been trying to get their act together to save a Banksy mural from demolition on a Gas Station wall in West LA. Banksy did the mural while he was in LA for a wedding a couple of years ago. He actually asked the owner if he could “tag” the wall with his spray paint mural and was given permission! So, I went to Los Angeles today to meet with owners, contractors and auction house reps to discuss taking the mural off a wall and then the final result will be sold at auction. It looks like they are ready to get started in the next couple of weeks… maybe. Here’s the photo of the mural, which you can’t see anymore cause its covered up to protect it. This is one of two murals. If you haven’t heard about Banksy, he’s a English graffiti artist that has achieved celebrity status. If you’d like to be “in the know” go to banksy.com or look him up on Wiki. Even a movie has been made of him and his work called “Exit Through the Gift Shop”. See banksyfilm.com. This should make for some interesting posts and a video. Stay tuned! Any guesses as to the value? Leave a comment! Give this a THUMBS UP?! This entry was posted in Murals and tagged Banksy, mural removal. Bookmark the permalink. Alicia, I received your very kind gift of honey. As you know, people don’t often say thank you or follow through so it was a very pleasant surprise to receive your gift. The honey is delicious. 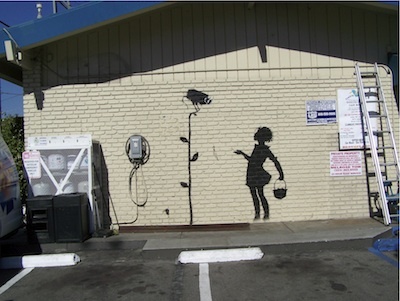 I also have another Banksy recovery project in LA that we’ll get started on this month. Stay in touch! Just wanted to give you a bit of an update. It ended up that we were dealing with upwards of 20 layers of spray and masking paint over the Bansky mural. It was difficult to distinguish what paint was from the original mural, but I do believe it was possible with the suggestions you gave me. Testing was promising, but it would have taking quite some time and would of been out of the client’s budget. So we needed to let this one go. There are always exciting and fun projects ongoing so I wasn’t too heart broken. I really appreciate the time and help you gave to me – very kind indeed. Aside from being a art conservator, I am also a bee keeper and I would love to send you over a bit of this seasons honey as a big thanks. What is the best address I can send some to? Have you seen the movie about Banksy? Cool stuf. Crazy that you are going to get to save a couple of his graffiti art. Good job. Hello there, you certainly have an incredible job. Helping to save art seems like it would be so satisfying. It even seems like your job has a social conscience and improves the community. Thanks. This is freakin’ great to have a Banksy mural in LA. Too bad it can’t stay on location but it better to save it than have it destroyed with the demolition. Is it going to stay visible to the public? The whole idea of his murals and “tags” is that they are free to the public. Wonderful website… very interesting for those of us that love art but never get to see “behind the scenes.” A lot of useful info here and thanks for setting up the Tips for Art Collectors blog. I’m sending it to a few buddies. So, thank you for your quality effort! I’ve learn a few excellent and unexpected stuff here about Banksy in LA. Banksy is fun personality to follow. I’m glad you save his mural. Wohaa! This blog is wonderful. I love your posts and this one on Banksy was so unexpected to find seeing that he is English and all. Well, to tell you the truth, several of them are really unusual type projects. Thanks for sharing your expertise. Thanks for commenting Erica, Yes, this mural really is a piece of history in LA. In 1970, when this mural was done, there was no street art in LA and certainly no one with the skills of Kent Twitchell. His murals are mind blowers. I know Bansky’s work very well, from the “rats” he leaves around the world (we have one in Rome in Piazza Angelicum) to his guerrilla’s murals. I am sooo glad they are trying to save one of his artwork from demolition. Are you going to be part of the team? Hello again Abhijit and thanks for staying in touch, “liking” our postings and leaving comments. Its great to stay in contact. Congratulation’s on the interesting project! Hello again from India. The brick is decorative, not structural. The brick is covered with 50 years of exterior paint. The mural paint is spray paint, applied fairly thin. It looks like the mural is painted on brick. Is it ? Good comments Maria. But I don’t pretend to know the mind of a graffiti artist… or for that matter, ANY artist. There are two “murals” on the property that he asked permission to put up. These two murals have been listed and acknowledged by Banksy, according to the auction house. Nice, Scott. I’m glad you’re putting these blurps on here. Personally, I haven’t done any research on the artist. I’m just referring to you all I’ve been told. If that is really him….something is seriously different about his approach now. WOW! Your project sounds like quite the undertaking! Glad he acknowledged. Maybe he’s mellowing out. I know I am! This does surprise me as Banksy was quoted as saying, ‎”You owe the companies nothing. Less than nothing, you especially don’t owe them any courtesy. They owe you. They have re-arranged the world to put themselves in front of you. They never asked for your permission, don’t even start asking for theirs.” It’s hard to find an actual photo of Banksy, I always thought his schtick was elusiveness and doing this under the cover of darkness…not introducing himself and asking for permission. Banksy is awesome! I saw that movie a few days ago, it was amazing, and his work is amazing.